First-round pick Logan Gilbert and third-round pick Cal Raleigh remain unsigned. 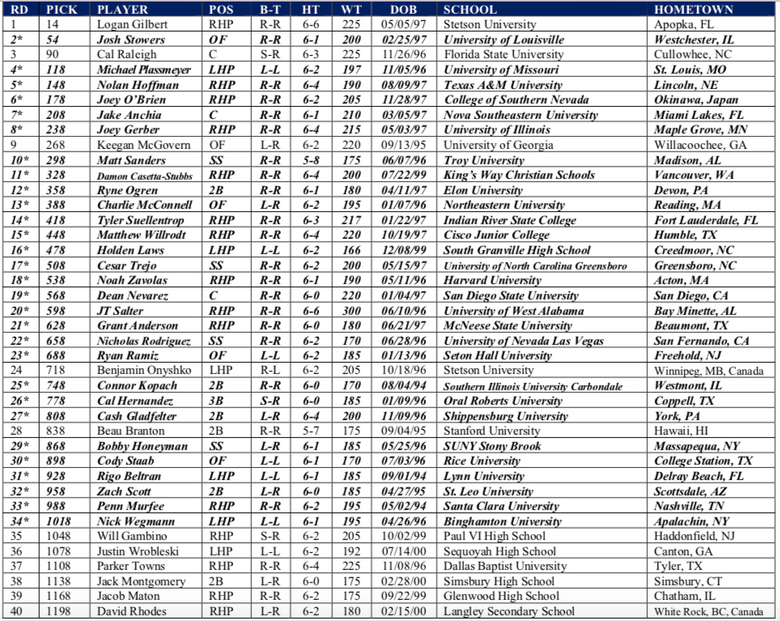 The Mariners have signed 29 of their 40 picks from last week’s Major League Baseball amateur draft. But hard-throwing right-hander Logan Gilbert, the team’s first-round pick and 14th selection overall, remains unsigned. He is one of three picks in the first 10 rounds not to be signed. Third-round pick Cal Raleigh, a switch-hitting catcher out of Florida State, and eighth-round pick Keegan McGovern, a power-hitting outfielder out of Georgia, are also unsigned. Baseball sources said that Gilbert’s signing should come in the next few days. He’ll likely do that at Safeco Field and make an appearance before Saturday’s game vs. the Red Sox. Here’s the list of Mariners picks. Players in bold have signed.